Who watches over the “Watchmen” of our Financial and Banking Services Industries? Recently, I watched the movie Watchmen, which is about a vigilante group of corrupt and subversive so-called super-heroes, whose mission is to watch over humanity, but they end up destroying many human lives, in order to further their own agenda. I cannot help but strike an analogy between the vigilante group in the movie and the Federal Reserve System and the Treasury Department, who have the authority to regulate and watch over our financial markets and the banking system. Huge amounts of money lent by the Fed to the Depository Institutions (which form a unit of the Federal Reserve System, itself), with no requirement on their part to provide accountability on whether or how that money was spent to foster liquidity in the market. As I will highlight from the analysis of the balance sheets, in later sections, it appears that this unaccounted-for, borrowed money itself might have been used by the Depository Institutions to orchestrate a run on the Prime Money Market Funds, which triggered the financial crisis of September 2008. Strong possibility of collusion of Investment Banks like Goldman Sachs and Merrill Lynch in orchestrating the run on Prime Money Market Funds, as found from analysis of AIG’s recent disclosure of CDS Counterparties and as explained in a later section. Inaccurate, unsubstantiated and highly exaggerated statements and press releases, by the reputed Mutual Fund Investment tracking institution Investment Company Institute(ICI) and Fed Chairman Ben Bernake, who reported exaggerated amounts of cash outflows from Institutional Funds, thereby adding to the anxiety of already fearful investors, which, in turn, motivated them to pull out even more money from these funds. An example of such exaggeration and inaccuracy can be seen in Bernanke’s recent CFR Speech, where he asserted that “fearful investors withdrew more than $250 billion from prime money market mutual funds” leading up to the Sep. 2008 financial crisis. The SEC was asleep at the driving wheel, when the above irregularities were happening. I even found an instance when the SEC changed the regulatory rules to support the US Treasury Department’s initiative to “insure the holdings of any publicly offered eligible money market mutual funds”, in order to stem the cash outflows from these funds, during the September crisis, on the basis of an inaccurate press release from ICI showing exaggerated amounts of cash outflows from these funds. This press release has now been removed from ICI’s website and interestingly, the same press release is also referred to by the wikipedia entry about the September Financial Crisis. While researching about Institutional Money Funds, I came across the prospectus of DREYFUS INSTITUTIONAL RESERVES GOVERNMENT FUND, which as per it’s latest holdings data, as of 03/15/09, holds total assets worth $41 billion. The scary thing that I found in the prospectus on page 2 is the fact that the Board of Trustees for the fund has approved the liquidation of the fund, effective on or about March 27, 2009. As will be seen from the subsequent sections of this report, it was the failure of some Institutional Money Market Funds, like the Reserve Primary Fund and BNY Institutional Cash Reserves, both of which broke the buck, that triggered the September Financial Crisis of 2008. Are we going to have another financial crisis, around Mar. 27, 2009, when the DREYFUS INSTITUTIONAL RESERVES GOVERNMENT FUND liquidates? Will the Government declare bankruptcy, this time? The week ahead (03/16 – 03/20) is going to be a crucial one on the Capitol Hill, when the Senate Banking Housing And Urban Affairs Committee, the Senate Finance Committee, the House Financial Services Committee and the House Oversight And Government Committee are all going to hold hearings on the state of our economy, banking and financial services industry. Any decisions made by congress, in the coming week, to improve regulation in the financial services industry and overhaul the banking system to improve transparency on lending by the Federal Reserve Banks will be crucial to avert another financial crisis, possibly triggered by the liquidation of the DREYFUS INSTITUTIONAL RESERVES GOVERNMENT FUND. So, please call, fax or e-mail your representatives, pointing them to this report and ask them to go through atleast the Conclusion and Recommendations section of this report, if they cannot go through the entire report and take immediate action to avert a complete financial meltdown. Before I go into more details to explain my findings, I’ll first post a glossary of terms, so that any lay person who is reading this report can make sense of it. The Reserve Primary Fund is a large money market mutual fund. Normally, the net asset value of money market funds is kept at $1. On September 16, 2008, during the Global financial crisis of September-October, 2008, it lowered its share price below $1 (breaking the buck) because of exposure to Lehman Brothers debt securities. This resulted in demands from investors to return their funds as the financial crisis mounted. The Reserve had multiple other funds frozen because of this failure. They have liquidated a few funds, and post periodic updates about plans to liquidate other funds on their website. Institutional money funds are high minimum investment, low expense share classes which are marketed to corporations, governments, or fiduciaries. They are often set up so that money is swept to them overnight from a company’s main operating accounts. Large national chains often have many accounts with banks all across the country, but electronically pull a majority of funds on deposit with them to a concentrated money market fund. The largest institutional money fund is the JPMorgan Prime Money Market Fund, with over US$100 billion in assets. Among the largest companies offering institutional money funds are BlackRock, Western Asset, Federated, Columbia (Bank of America), Dreyfus, AIM and Evergreen (Wachovia). From this definition, it is evident that the Reserve Primary Fund is an institutional money fund. Retail money funds are offered primarily to individuals with moderate-sized accounts. Their primary use is as temporary holding funds at stock brokerage firms. Retail money market funds hold roughly 40% of all money market fund assets. Retail money funds invest in short-term debt, such as US Treasury bills and commercial paper, come in a few different breeds: government-only funds, non-government funds and tax-free funds. Yields are typically somewhat higher than in savings accounts. Investors will obtain a slightly higher yield in the non-government variety, whose principal holdings are high-quality commercial paper and other instruments. Instruments of the United States Government are usually exempt from state income taxes, and their returns are lower as a result. The largest money market mutual fund is Fidelity Investments’ Cash Reserves (Nasdaq:FDRXX), with assets exceeding US$110 billion. The largest retail money fund providers include: Fidelity, Vanguard (Nasdaq:VMMXX), and Schwab (Nasdaq:SWVXX). A depository institution is a financial institution in United States, such as a savings bank, that is legally allowed to accept monetary deposits from consumers. Federal depository institutions are regulated by the Federal Deposit Insurance Corporation (FDIC). An example of a non-depository institution might be a mortgage bank. While licensed to lend, they cannot accept deposits. On the other hand, an investment bank like Goldman Sachs would qualify as a Depository Institution, whom the Fed can directly lend money. The Federal Reserve has the authority to act as “lender of last resort” by extending credit to depository institutions or to other entities in unusual circumstances involving a national or regional emergency, where failure to obtain credit would have a severe adverse impact on the economy. As, I will later show, from my analysis that in 2008, the Fed completely ignored this directive of being the “lender of last resort” and has lent frequently to the Depository Institutions, through newly created financial instruments and that money has not made its way to the financial markets to free up the liquidity crunch. Now, what exactly are the depository banks that the Fed uses to lend money? Although, the Fed does not disclose this (and even wikipedia hides their identity), this link shows that DTCC through its subsidiaries DTC and Cede & Co. acts as the largest Depository Bank for the Fed. This fact can be easily verified by anyone. Just Google for Cede & Co. along with the name of your city/county and bond agreements like this, can be found. Also, here is the big surprise…Cede & Co. is co-owned by George Soros, as per this article published in the UK Times. The Term Auction Facility (TAF) is a temporary program managed by the United States Federal Reserve designed to “address elevated pressures in short-term funding markets”. Under the program the Fed auctions collateralized loans with terms of 28 and 84 days to depository institutions that are “in generally sound financial condition” and “are expected to remain so over the terms of TAF loans.” Eligible collateral is the same as that accepted for discount window loans and includes a wide range of financial assets. The program was instituted in December 2007 in response to problems associated with the subprime mortgage crisis and was motivated by a desire to address a widening spread between interest rates on overnight and term (longer than overnight) interbank lending, indicating a retreat from risk-taking by banks. The action was in coordination with simultaneous and similar initiatives undertaken by the Bank of Canada, the Bank of England, the European Central Bank and the Swiss National Bank. On March 17, 2008, in response to the subprime mortgage crisis and the collapse of Bear Stearns, the Federal Reserve announced the creation of a new lending facility, the Primary Dealer Credit Facility (PDCF). Eligible borrowers include all financial institutions listed as primary dealers, and the term of the loan is a repurchase agreement, or “repo” loan, whereby the broker dealer sells a security in exchange for funds through the Fed’s discount window. The security in question acts as collateral, and the Federal Reserve charges an interest rate equivalent to the Fed’s primary credit rate. The facility was intended to improve the ability of broker dealers to access liquidity in the overnight loan market that banks use to meet their reserve requirements. The creation of the Primary Dealer Credit Facility constitutes the first time in the history of the Federal Reserve that the Fed has lent directly to investment banks, and it reflects the severity of the financial crisis perceived by Federal Reserve Chairman Ben Bernanke. Non-bank institutions such as investment banks exist outside the Fed’s regulatory structure. A full detail of the nominal value of loans outstanding through the PDCF is available in the Federal Reserve’s public balance sheet. During the first three days the facility was open, an average of $13.3 billion was borrowed daily with $28.8 billion in loans outstanding. Lending activity peaked in the first week of October 2008, averaging around $150 billion daily. The Asset-Backed Commercial Paper (ABCP) Money Market Mutual Fund (MMMF) Liquidity Facility is a lending facility that provides funding to U.S. depository institutions and bank holding companies to finance their purchases of high-quality asset-backed commercial paper from money market mutual funds under certain conditions. The program is intended to assist money funds that hold such paper in meeting demands for redemptions by investors and to foster liquidity in the ABCP market and money markets more generally. This financial instrument was introduced by the Fed on Sep. 19, 2008, in the midst of the financial crisis to foster liquidity in the ABCP markets and broader money markets. Commercial Paper Funding Facility (CPFF) is a system created by the Federal Reserve Board during the Global financial crisis of 2008 to improve liquidity in the short-term. The CPFF was created on 27th October 2008 and funds a special purpose vehicle (SPV) that will purchase three-month unsecured and asset-backed commercial paper directly from eligible issuers. This results in greater availability of credit for firms doing business. It works under the aegis of the Federal Reserve Bank of New York where the NY Fed finances the purchase of highly-rated unsecured and asset-backed commercial paper from eligible issuers via eligible primary dealers. The Money Market Investor Funding Facility (MMIFF), authorized by the Federal Reserve Board under Section 13(3) of the Federal Reserve Act, supports a private-sector initiative designed to provide liquidity to U.S. money market investors. Under the MMIFF, the New York Fed will provide senior secured funding to a series of special purpose vehicles to facilitate an industry-supported private-sector initiative to finance the purchase of eligible assets from eligible investors. The MMIFF was introduced by the Fed on Oct. 21, 2008. A credit default swap (CDS) is a credit derivative contract between two counterparties. The buyer makes periodic payments to the seller, and in return receives a payoff if an underlying financial instrument defaults. The buyer of a CDS does not need to own the underlying security or other form of credit exposure; in fact the buyer does not even have to suffer a loss from the default event. By contrast, to purchase insurance the insured is generally expected to have an insurable interest such as owning a debt. This section provides an explanation of the sequence of events that led to the run on Prime Money Market Mutual Funds, in September 2008 and the analysis of the situation, as per wikipedia. I have added a section specifying the Fed and the Treasury Department’s actions to stem the crisis and this was taken from the article titled “Turmoil in the Cash Markets: Did Enhanced Cash and Money Market Strategies Overdo Risk?“ by Paul Reisz, December 2008. Also, I have specified in the Events section, how an exaggerated and incorrect amount of cash outflows from the Institutional Money Funds was reported by the reputed Investment Company Institute(ICI), when it reported on the run on funds on Sep. 18 and that might have actually triggered a panic reaction from the US Treasury Department and the SEC to go for drastic measures like borrowing taxpayer money to bail out financial institutions. On Monday, 15 September 2008, Lehman Brothers Holdings Inc. filed for bankruptcy. On Tuesday, 16 September 2008, Reserve Primary Fund, the oldest money fund, broke the buck when its shares fell to 97 cents, after writing off debt issued by Lehman Brothers. On the same day, BNY Institutional Cash Reserves, which was not a money fund, but a securities lending fund run by BNY Mellon, also broke the buck – its NAV fell to 99.1.cents – also due to Lehman holdings. The resulting investor anxiety almost caused a run on the bank for money funds, as investors redeemed their holdings and funds were forced to liquidate assets or impose limits on redemptions: through Wednesday, institutional funds saw net outflows of $173 billion to $2.17 trillion, a withdrawal of over 7%. Retail funds saw net inflows of $4 billion, for a net capital outflow from all funds of $169 billion to $3.4 trillion (5%). The lack of retail outflows is attributed to the lag required for individuals to open a new account, to transfer their funds out and retail funds expected significant withdrawals the following week. The readers must have noticed that this page referred to in the previous sentences is no longer available at the ICI website.Instead ICI now has the Weekly Historical Data, posted on it’s website, showing the Weekly Total Net Assets (TNA) and Number of Money Market Mutual Funds. If we look at the change in the TNA for Institutional Money Market Funds in the week between Sep. 10 and Sep. 17 2008, we see a drop in assets from $2.278 trillion to $2.158 trillion, i.e. a net cash outflow of $119.183 billion which is far less than the number of $173 billion reported in the ICI press release of Sep. 18. So, it does look like ICI made a mistake in reporting the actual amount of cash outflows in the Sep. 18 press release, which might have contributed in lowering the investors’ confidence in these funds, even further and thus contributed to the run on these funds. Only a Congressional hearing of the ICI officials, can now determine, if this error in reporting was intentional or whether it was an honest mistake in accounting. In the meantime, the insurer AIG suffered from a liquidity crisis after its credit ratings were downgraded below “AA” levels. Bloomberg News reported that AIG had sold CDS protection to investors on $441 billion of fixed-income investments, including $57.8 billion in securities tied to subprime mortgages. The swaps already forced $25 billion in writedowns over nine months. The Federal Reserve Bank on September 16, 2008, created an $85 billion credit facility to enable the company to meet collateral and other cash obligations, at the cost to AIG of the issuance of a stock warrant to the Federal Reserve Bank for 79.9% of the equity of AIG. On Thursday, 18 September 2008, Putnam Investments’ Prime Money Market Fund, a $15 billion institutional fund, announced that it was liquidating, due to redemption pressures. In response, on Friday, 19 September 2008, the U.S. Department of the Treasury announced an optional program to “insure the holdings of any publicly offered eligible money market mutual fund — both retail and institutional — that pays a fee to participate in the program.” The insurance will guarantee that if a covered fund breaks the buck, it will be restored to $1 NAV. This program is similar to the FDIC, in that it insures deposit-like holdings and seeks to prevent runs on the bank. The guarantee is backed by assets of the Treasury Department’s Exchange Stabilization Fund, up to a maximum of $50 billion. It is very important to realize that this program only covers assets invested in funds before 19 September 2008 and those who sold equities, for example, during the recent market crash and parked their assets in money funds, are at risk. The program immediately stabilized the system and stanched the outflows, but drew criticism from banking organizations, including the Independent Community Bankers of America and American Bankers Association, who expected funds to drain out of bank deposits and into newly insured money funds, as these latter would combine higher yields with insurance. In November 2008 the U.S. government revised its loan package to the insurer AIG, increasing the total amount to $152 billion. AIG is attempting to sell assets to repay the loans. So far the U.S. government has given the company over $170 billion. First, they needed to stop the run on the bank. Too many redemptions in prime money market funds would cause a feedback loop and more prime funds might break the buck. Therefore, the Treasury established a temporary money market guaranty program recently extended until April 30, 2009, and eligible to holdings held as of September 19 to stop the run. This program insures money market assets of those funds that enroll and pay a small premium of assets. The next step was to create liquidity in the commercial paper markets: the Federal Reserve established the AMLF, or Asset-Backed Commercial Paper Money Market Mutual Fund Liquidity Facility, which gives banks financing to buy high-quality ABCP from money market funds through January 2009. Another step was needed to create liquidity in the unsecured commercial paper market. The New York Fed launched the Commercial Paper Funding Facility (CPFF), a special purpose vehicle funded by the Fed which will buy highly rated asset-backed and unsecured commercial paper directly from U.S. issuers. So far, this facility has helped add liquidity for direct issuers and reduce the LIBOR-OIS spread. These steps still hadn’t addressed the sale of commercial paper in the secondary market, so the Fed also agreed to provide up to $540 billion in loans to money market funds beset by redemptions. This program, the Money Market Investor Funding Facility (MMIFF), launched in late November and helps mutual funds sell term commercial paper on the secondary market. We expect this to free up more liquidity. The crisis almost developed into a run on the shadow banking system: the redemptions caused a drop in demand for commercial paper, preventing companies from rolling over their short-term debt, potentially causing an acute liquidity crisis: if companies cannot issue new debt to repay maturing debt, and do not have cash on hand to pay it back, they will default on their obligations, and may have to file for bankruptcy. Thus there was concern that the run could cause extensive bankruptcies, a debt deflation spiral, and serious damage to the real economy, as in the Great Depression. The drop in demand resulted in a “buyers strike”, as money funds could not (because of redemptions) or would not (because of fear of redemptions) buy commercial paper, driving yields up dramatically: from around 2% the previous week to 8%, and funds put their money in Treasuries, driving their yields close to 0%. However, a huge question that needs to be answered, at this point and which the US Treasury Department should have been asking when the financial crisis was unfolding, was why were the Depository Institutions and Primary Dealer Financial Institutions not buying any commercial paper to foster liquidity. The Fed had already lent more than $170 billion, at that point of time (as per Fed’s weekly stats), using the TAF and PDCF financial instruments, respectively and so these banking/financial institutions were perfectly capable of fostering liquidity in the market and stemming the crisis. In the next section, by analyzing the balance sheets posted on the Fed website and also by highlighting the close links of the Depository Institutions, with some of the biggest Institutional Money Market Funds, it will be shown that there is a very high likelihood that the Depository Institutions were themselves involved in the run on the Prime Money Funds and might have even orchestrated the run, artificially. This is a bank run in the sense that there is a mismatch in maturities, and thus a money fund is a “virtual bank”: the assets of money funds, while short term, nonetheless typically have maturities of several months, while investors can request redemption at any time, without waiting for obligations to come due. Thus if there is a sudden demand for redemptions, the assets may be liquidated in a fire sale, depressing their sale price. An earlier crisis occurred in 2007–2008, where the demand for asset-backed commercial paper dropped, causing the collapse of some structured investment vehicles. As is the case with most of the folks in this country, anyone who has not been looking at the Fed Balance Sheets regularly and not keeping track of how much money has been lent by the Fed to the Depository Institutions and Primary Dealer Financial Institutions, via the TAF and PDCF financial instruments, will be astonished to know about the amount of money that has been lent, if they look at Fed’s latest weekly stats. As of Mar. 12, 2009 the total amount of credit borrowed by the Depository Institutions and Primary Dealer financial institutions amounts to $512.878 billion dollars. Also, from the Fed’s TAF website, it can be seen, that of late, the Fed has been offering through this instrument, huge amounts ($150 billion, in each instance) of money to the depository institutions, without requiring or disclosing any accountability data from those institutions, about how that money was being spent. The weekly historical data related to depository institutions, available at the Fed website, shows that due to excessive borrowing by the Depository Institutions, the amount for non-borrowed reserves for these institutions went into negative territory in 2008, for the first time in its entire history. If anyone looks at the Fed’s weekly stats for all the prior weeks, starting with the week in Dec. 2007, when money was first borrowed using the TAF instrument, it can be seen that only a very small part of the borrowed money, is being returned, even though these loans have terms of only 28 and 84 days. This is a recipe for financial bankruptcy for the taxpayer. Now, let’s look at the links that some of these Depository Institutions and Primary Dealer Financial Institutions have to the Institutional Money Market funds that are at the heart of the September 2008 financial crisis. The BNY Institutional Cash Reserves fund, which was one of the funds that broke the buck, leading up to the Sep. 2008 financial crisis is run by BNY Mellon. If we look at the DTC Participants Account List numerous BNY Mellon accounts can be seen in that list. In fact, I even found Bernard L. Madoff Investment Securities LLC in the list. As most folks know, Bernard Madoff was recently convicted and jailed for running a $50 billion Ponzi scheme. Now, this begs the question, as to how much of the TAF borrowed money from the Fed was swindled by the Depository Institutions into Madoff’s Ponzi Scheme. Only a complete review of the transactions by the Depository Institutions will show that and Congress has the authority to enact legislation, to force the Fed to disclose that. Both from the DTCC Contact List and the DTC Account List it is evident that, most likely, the Depository Institutions invested in the Institutional Funds on which there was a run that triggered the Sep. 2008 financial crisis. I came across a press release from the DTCC which mentions that Dreyfus Investments joined it’s managed account service in Oct. 2007. So, apparently DTCC also might have holdings in DREYFUS INSTITUTIONAL RESERVES GOVERNMENT FUND, which is the fund that is about to go into liquidation on or about March 27, 2009, as I mentioned in the Introduction section. Now, let’s see, if by looking at the balance sheets, we can identify any evidence of the involvement of the Depository Institutions and/or the Primary Dealer Financial Institutions in the run on Institutional Money Funds. On analyzing the Fed’s weekly bank savings and money fund cash flows data, it becomes apparent that months before the Sep. 2008 crisis unfolded, there were several instances of cash inflows into the Institutional Money Funds, when there was no matching cash outflow from the Commercial Banks. This can mean only one thing and it is that the cash inflows into the Institutional Funds, in that period, were coming from the Fed, via the Depository Institutions and/or the Primary Dealer Financial Institutions using financial vehicles like TAF and/or PDCF. One such instance is the cash inflow of about $37 billion into the Institutional Funds, between Feb. 4 and Feb. 11 in 2008. During the same period, there was no cash outflow from the commercial banks and in fact, we see a cash inflow of about $62 billion into the Commercial Banks’ Savings Deposits. There was no cash outflow from the Retail Money Funds, either, in this period and instead, there was a cash inflow of about $8 billion into those funds. So, all this money into the system had to have come from the Fed. Now, if we look at Fed’s weekly stats released on 02/07/08 we see that the Fed lent $10 billion to the Depository Institutions, thereby bringing the total amount of their borrowed reserves obtained using the TAF vehicle to $60 billion. So, in most likelihood, the depository institutions had used some of the TAF reserves to invest into the Institutional Funds. In this period the PDCF vehicle was not in existence and so these investments could only have come out of the TAF borrowed reserves, held by the Depository Institutions. A similar set of transactions is seen in the following week, i.e. between 02/11/08 and 02/18/08, when there was a cash inflow of about $24 billion into the Institutional Funds, whereas there was a cash outflow of only $12 billion from the Commercial Banks’ Savings Deposits, in that period. Similar set of transactions is seen in the week of 04/07/08 and 04/14/08, when there was a cash inflow of about $35 billion into the Institutional Funds, $2 billion into the Retail Funds and a cash inflow of about $7 billion into the Commercial Banks’ Savings Deposits, in that period. If we look at Fed’s weekly stats, for just the week prior to that week, we see that the Fed had lent $20 billion dollars via the TAF vehicle to the Depository Institutions bringing their TAF borrowed cash reserves to $100 billion. All this data indicates that the Depository Institutions were pouring money into the Institutional Funds, in the months prior to the Sep. ’08 financial crisis and they might have later used their holdings to orchestrate a run on the Prime Money Market Funds in September. Now, let’s see if there is any evidence in the balance sheets of the involvement of the Depository Institutions in the bank run. On looking at the Fed’s weekly bank savings and money fund cash flows data, for the weeks when the crisis unfolded, i.e. between 09/08/08 and 09/22/08 we see a cash outflow of $134 billion from the Institutional Funds, a cash inflow of $9.6 billion into the Retail Funds and an inflow of $36.5 billion into the Commercial Bank Savings Deposits and $5.9 billion into Commercial Bank small-denomination time deposits. So, where did the remaining $82 billion cash outflow go? It had to have come out of the Fed borrowed money being laundered by the Depository Institutions and was used by them to orchestrate a run on the Prime Money Market Funds that subsequently triggered the Sep. ’08 financial crisis. 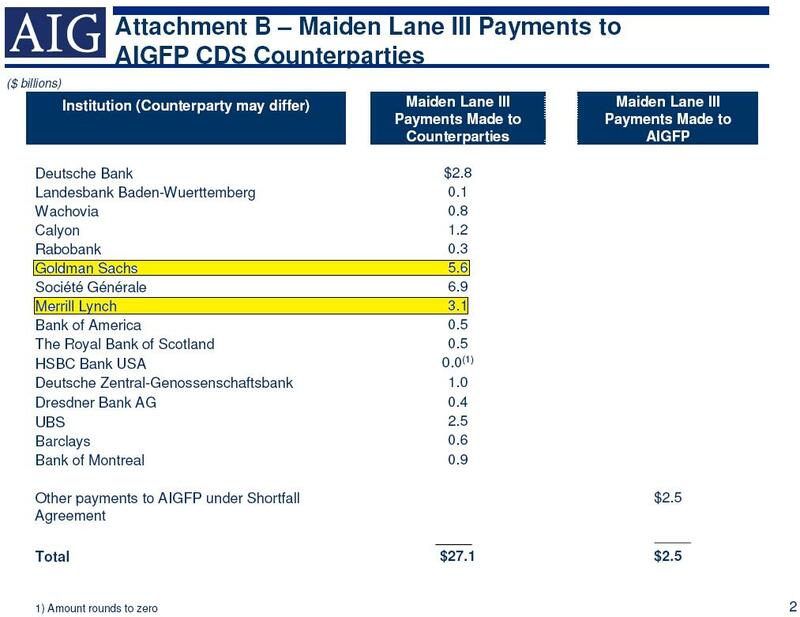 As is evident from the above list the Investment Only Banks Goldman Sachs and Merrill Lynch accounted for a large chunk ($8.7 billion) of the CDS payments to counterparties. In fact, Goldman Sachs and Merrill Lynch were the only investment-only banks in the above list. Goldman Sachs was still an Investment Only bank at the time of the AIG liquidity crisis and it converted to a Commercial Bank, about a week later, as seen in this CNN report. Also, Merrill Lynch was acquired by Bank of America, only later, in December. This implies that there is a strong possibility that a lot of the securities held by these investment banks that defaulted and were covered by the AIG CDS were actually linked to the Institutional Money Market Funds on which there was a run, in the days leading up to the AIG liquidity crisis. Also, Goldman Sachs states on its website about its GSAM product that “GSAM also ranks in the top three institutional money market managers globally”. Now, another fact to consider is if DTCC or any other non-Commercial Bank Depository Institution were to invest the money lent by the Fed via the TAF financial instrument directly into Institutional Money Market Funds, then it would invest the money via fund managers or investment banks like Goldman Sachs and Merrill Lynch. Any money lent by the Fed and invested into or withdrawn from the Institutional Money Market Funds via the Investment Banks would not show up on the balance sheets of the Commercial banks and would also account for $82 billion of cash outflow from the Institutional Money Market Funds during the bank run, as was found from the Fed’s balance sheets. That would also imply that the Institutional Money Fund managers from these investment banks colluded in orchestrating the run on these funds and they were getting paid via the AIG CDS for crashing their own funds, which is analogous to insurance fraud. So, the first place where the investigators should look into, for irrefutable evidence of orchestration of the $82 billion run on Institutional Money Funds is into the balance sheets of the Institutional Money Fund Management products like GSAM that were being sold by Goldman Sachs and Merrill Lynch. As is evident from the analysis of the Fed balance sheets, there is a strong prossibility that the run on Prime Money Market Funds that triggered the Sep. 2008 financial crisis was orchestrated by the Depository Institutions, which are themselves a unit of the Federal Reserve Banking system. The Primary Dealer Financial Institutions that borrow money from the Fed using the PDCF vehicle could not have been involved, at all in the bank run, since the Fed’s weekly stats for the week prior to that of the bank run show that there were no outstanding borrowed PDCF reserves. There is a strong possibility of collusion of Investment Banks like Goldman Sachs and Merrill Lynch in orchestrating the run on Prime Money Market Funds, as found from analysis of AIG’s recent disclosure of CDS Counterparties. The inaccurate reporting by ICI of exaggerated cash outflows from the Institutional Money Funds, in their press release of Sep. 18, most likely aggravated the crisis by causing fearful investors to withdraw even more money from these funds. ICI reported in their press release that “through Wednesday, institutional funds saw net outflows of $173 billion to $2.17 trillion, a withdrawal of over 7%”, whereas ICI’s weekly historical data sheet shows that there was a net cash outflow of $119.183 billion, which is a much lower figure than that reported in ICI’s press release. The Depository Institutions and Primary Dealer Financial Institutions were already sitting on top of $170 billion that they had borrowed from the Fed, when the Sep. ’08 crisis unfolded and so they could’ve bought commercial paper to stem the crisis. If they were not buying commercial paper, SEC should’ve intervened, right away, to have them use that money to foster liquidity in the markets. Why these financial institutions did not lend money and why the SEC did not intervene are questions that the officials from these institutions must answer in a Congressional testimony. The use of taxpayer money borrowed as part of TARP to bail out Commercial Banks, by buying senior preferred stock and warrants in the nine largest American banks, as was done by Treasury Secretary Paulson, after Oct. 14, 2008 is a complete waste of taxpayer money, since the weekly bank savings data from the Fed website shows that the total bank savings at Commercial Banks stood at $3.314 trillion on Oct. 14, which is the largest bank savings amount ever, till that point in time. This is a scam on the American people and it is possible that this money is/was being funneled to the Depository Institutions, using the TAF vehicle, since the Depository Institutions are now sitting on top of borrowed reserves of roughly half a trillion dollars as per the latest weekly stats, posted on the Fed website. Current Treasury Secretary Tim Geithner is aware of this money being funneled to the Depository Institutions, since as part of the TAF program, under his watch the Fed has been offering $150 billion every 14 days, as is evident from the Fed TAF website. In fact, Geithner was the one who proposed the introduction of the TAF financial instrument, when he was the President of the NY Fed, as per this Bloomberg News Report. Geithner was also one of the original architects of the TARP bailout program, also as the President of the NY Fed. Geithner, Bernanke and Paulson, all 3 should be called in to give testimony to the Congress, as to why half a trillion dollars of taxpayer money was lent to the Depository Institutions under the TAF program and how that money was being invested by the Depository Institutions. They should also be asked to disclose where and to which banks the TARP money is going and why the TARP money is being funneled to banks in the first place, considering the record high Commercial Bank Savings data. If it is found that, instead, the TARP money is being funneled to the Depository Institutions, as part of the TAF program all of them should be indicted and jailed. Even otherwise they should be impeached and jailed for fooling the American taxpayer, to make us think that there was a bank liquidity crisis. With all the above orchestrated turmoil, i.e. to put up the show of a financial crisis and to use that to subsequently funnel US taxpayer money, there must be a bigger motive behind it. The biggest question is why all of this was orchestrated in September, just about a month before the Presidential Election, when McCain was leading in the poll ratings. It is no secret that George Soros, who is the co-owner of Cede & Co., which is a subsidiary of DTCC (the biggest Depository Institution) is a big Obama supporter. Also, Goldman Sachs, which might have actually executed the bank run that triggered the financial crisis, was the second largest donor to Obama’s campaign as per this wikipedia link. So, could all of this have been orchestrated by Soros, Goldman Sachs and their co-conspirators to get Obama elected, i.e. basically to get their Manchurian Candidate elected? Soros, Goldman Sachs and Merrill Lynch executives should be brought in front of the Congress to first disclose the account statements for accounts receiving the TAF money. If from those statements, it is confirmed that they orchestrated the bank run leading up to the financial crisis, they need to be grilled about their real motive. Irrespective of that, Obama should anyway resign or be impeached by Congress, since a hoax of this magnitude was committed on the American taxpayer, on his watch and he is sure to have had some insider information about it, even if he was not a co-conspirator. The most important issue is that he did nothing to expose this scam and instead continued with his agenda to waste more of the taxpayer’s hard-earned money towards pork-laden stimulus bills and earmark-laden budgets. Obama is anyway not even eligible to be POTUS, because his Natural Born Citizen status has not been verified by anyone and now even his college attendance records at the Occidental College are not being released, even after the lawyer of the Presidential Candidate Alan Keyes filed a subpoena asking for those records so that it can be verified whether Obama received aid as an Indonesian foreign student. Law Enforcement Agencies and the DOJ should ASAP look into the balance sheets of Institutional Money Fund management products of Goldman Sachs and Merrill Lynch, especially those products that were insured using the AIG CDS, since there is a strong possibility that these Investment Banks were the ones who executed the run on Prime Market Money Funds that triggered this financial crisis. This can be the starting point of investigating and accounting for the $82 billion cash outflow from the Institutional Money Funds that triggered the crisis. A commission, similar to the 9/11 commission should be established by the Congress to audit the Federal Reserve Bank’s balance sheets and the bank account records of all the Depository Institutions that have borrowed money, under the TAF program and that of all the Primary Dealer Financial Institutions that have borrowed money, under the PDCF program. Treasury Secretary Geithner should be questioned throroughly about how the TAF money was being used by the Depository Institutions, since he was the one who proposed the introduction of the TAF financial instrument. If in this investigation it is confirmed that these institutions intentionally orchestrated a bank run or intentionally hoarded the borrowed money in their bank accounts to cause an artificial liquidity crisis in the market, all credit lent to these institutions should be immediately withdrawn and these institutions should be banned from the banking services industry. All the co-conspirators involved in orchestrating this financial crisis, even if he is the POTUS, should be arrested and put behind bars. At the very least, Treasury Secretary Tim Geithner should resign for proposing the TAF and the TARP programs and his role in the AIG bailout and Intrade futures traders are already betting on that. All the Federal Reserve Officials, including Bernanke who have been accomplices in orchestrating this fraud on the American Taxpayer should be immediately removed from office and if needed, the Fed should be abolished. The SEC should immediately overhaul the financial regulatory rules, to prevent such bank runs, from happening in the future. The most immediate action from the SEC that is needed, right now, is for it to determine if the imminent liquidation of the DREYFUS INSTITUTIONAL RESERVES GOVERNMENT FUND, poses any danger to our economy and if so, the SEC needs to take immediate steps to prevent that. The most important change that is needed is for all the banking institutions that borrow money from the Fed, to disclose their identity and make their borrowing account statements available for audits on a regular basis. To prevent such a debacle from happening again, Congress should enact legislation that would facilitate weekly audits of the Fed’s balance sheets. It should be ensured that the directive of the Fed being the “lender of last resort” is adhered to religiously, so that huge amounts of money borrowed from the Fed can no longer be again used to orchestrate a bank run. There should be a complete overhaul of the currency system to get away from the fiat currency standard and get back to the Gold Standard. That will restore some stability to the economy and free us from these endless boom and bust cycles in the economy, where we are stuck, right now. Please forward a link to this blog to all your contacts so that everyone wakes up to what really is happening(or should I say being orchestrated?) with our economy. I will show this to others. Meanwhile, who has the condensed version of banksters lobby money and personel into congress and gov and fed reserve during the last 20 years or so. Aren’t there links between several congress people, financial institutions/lobby money/ and bills through congress traced for 20 years in generalized form. Like who left what financial company to enter gov and congress and pass bills that contributed. The most important action is to feed the children the bread of life. Reactions to that gives the greatest leverage. Thank you for this very well thought out and detailed report. I will pass this on! What are your thoughts on this report? Do you think it is an accurate article? [Ed:] This is a fascinating article. It shows that the Bear Sterns collapse was also a result of market manipulation. The article could have been made more believable by providing links to CFTC COT reports showing the Short Positions, but I do believe the author. I think, that may be the reason why the CFTC Acting Chairman Walter L. Lukken, who presided over CFTC when these irregularities occured, was recently forced out by some Dem. Congressmen, to cover up the scandal.